A High Energy concert from the band DECADES, one of Northern California's most in-demand bands. Expect Rock 'n Roll hits and Classic Songs from the 40s & 50s through today, featuring songs from Chuck Berry, Buddy Holly up to Katy Perry! Bring your family and friends to a musical party to be remembered ...for Decades! Since 2010, DECADES has been working (and rocking) around the clock to learn material spanning from the 1940's (Glenn Miller's Orchestra's "In The Mood") to today (Bruno Mars & Mark Ronson's "Uptown Funk"). The band has played over 700 shows all along the West Coast, and are well on their way to booking another 100+ shows for 2019, earning its place as one of California's most in-demand bands. Throughout a single show, they'll swap between several instruments (including saxophone, harmonica, trumpet to name a few) and belt out four-part harmonies, showcasing each members' musical versatility, while continuing to put on a highly energetic live show. Decades' impressive catalog, mixed with its young talents (ages 28-31), has led to numerous achievements and highlights. Some notable performances include playing AT&T Park and Great American Music Hall in San Francisco, the Francis Ford Coppola Winery, several fundraisers for the Oakland Raiders, the Hawaiian islands for 4 consecutive years, a 4th of July rooftop show at Harrah's Casino in Lake Tahoe, and opening for both Rain: A Tribute to the Beatles and The Drifters. 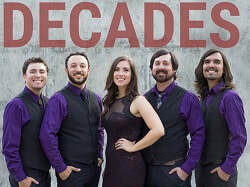 Decades' debut album, Take Me Back, and their sophomore album, Way Up High, were recorded by Grammy-nominated producer, Sylvia Massy (Red Hot Chili Peppers, Prince, Johnny Cash, Tool).